The GATS Jar is the first and finest fuel analysis tester capable of separating non-petroleum contaminants and thereby purifying water and debris from contaminated AVGAS and Jet fuel. 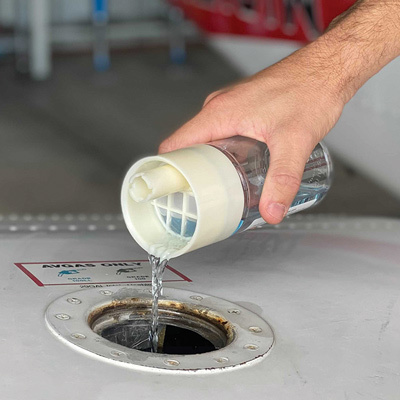 The GATS Jar allows extracted fuel to be put back into the aircraft instead of on the ground without the fear of reintroducing contaminants back into the fuel system. Once the fuel is sampled, the built-in screen separates solids and non-petroleum contaminants so that only clean fuel is returned to the tank. It also gives a visual display of AVGAS contaminated by jet fuel, and can be used with any petroleum fuel grade and octane, including Jet A fuel, automotive gasoline, and diesel fuel. Made of strong plastic with a wide mouth. Holds 12 ounces. Pros: Pros, it does work as a Gats Jar. Review: The thickness is closer to a thin water bottle than the old Gats Jars...will not hold up to heavy use in a large club or school...might be OK for a single owner. Review: OK. It's not really life changing. But it is a great way to sample all of the possible sumps on your airplane and return a clean sample to your fuel tanks. I like it. I'm glad I got it. Review: The GATS fuel jar strainer is great for checking the 13 spots on the Cessna 172, 182, and 205 I fly for CAP. It easily holds a wing tank load of 5 sump checks and it makes for easy pouring of fuel back into wing tank. Don't like throwing that expensive fuel on the ramp. Review: I always thought the GATS jar was a bit excessive for trainer aircraft but now that I'm flying a c340 I wouldn't want anything else.